Pros: Great card. Havent had any problems with it so far. Built a new system and got this card as my first choice. Upgrade from a 7950gt and see a-lot of a difference in games such as WOW and NWN2. Wont have to upgrade anything in the system for at least a year or 2. Cons: Little bigger then I expected but fits nicely ontop of my DFI DK 790GX MB in the Cooler Master Storm Scout case. Other Thoughts: Never knew it was a revamped version of an older card, but no complaints here. Was on a bit of a budget when I built the new system and at the time this card was a bit cheaper then the 260. Pros: It improved the Framerate I was receiving playing World of Warcraft, especially in highly congested areas. I am running in in a PCIe 1.0 slot and can't wait to see what it can do when I get it in my new x58 Mobo. Cons: So far, so good. No cons that I can see. Other Thoughts: seriously, forget that its a repackeged 9800GTX+ with the performance you get from only one of these who could possibly care? will play most games. two dominates almost everything. avg 250 fps in tf2 max settings. Cons: this is an outdated card. I was drawn in by the fancy name but it's just a 9800GTX++. don't be fooled by the higher core clock or more ram, the gtx 260 for around the same price will be a better buy than this card. the key is in the higher bit rating. 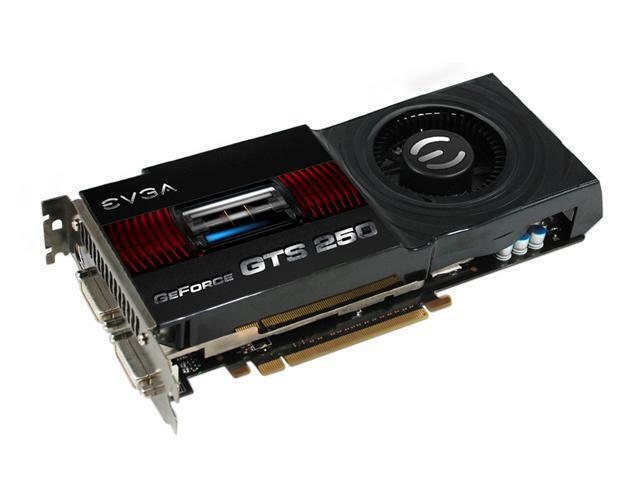 Pros: For the money this card does an amazing job..put two of them together in SLI and wow! Left cards running at standard speed..no need to push them. Ran COH, WAW,Left for Dead at crazy high settings know problem. Cons: The card is still rather large and create some heat but other than that none.